Red cabbage is a cabbage with a round, dense head of red or purple color. It is similar to green cabbage, except that it is slightly sweeter and its leaves are tougher due to its longer maturity time. Red cabbage is a vegetable high in vitamin C, vitamin A, potassium, vitamin K, calcium, and magnesium. It is also very low in calorie - 1 cup shredded raw red cabbage has only about 22 calories. 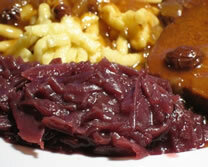 Red cabbage is a very popular vegetable in Germany, and is most often eaten cooked (braised) as shown here (left), but is also eaten raw, such as in salads. Cooked red cabbage is most often served as a side dish to roasts, Schnitzel, goose, duck, game, Bratwurst, and Sauerbraten. It also goes well other sides, such as Spätzle, potato dumplings (Klöße), mashed potatoes, and potato kroketten. Both raw and cooked red cabbage has a slightly sweet taste. For this reason, it is often prepared with ingredients such as apples, apple sauce, sugar, pears, onions, and spices such as cinnamon, cloves, juniper berries, bay leaves, nutmeg, etc. In northern Germany, acidic ingredients, such as vinegar or wine, are added when cooking red cabbage to keep the cabbage close to its original color. 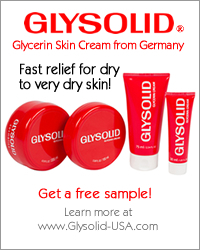 In Swabia, Bavaria, and Franken, alkaline ingredients, such as sugar or baking soda, are added. 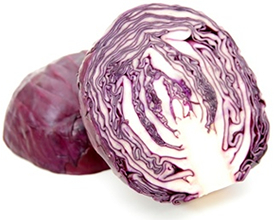 This makes the cabbage turn more of a blueish color, which is why it is called "Blue Cabbage" (Blaukraut) here. Select red cabbage heads that are firm and compact. Their outer leaves should be smooth and shiney with no brown marks or other discolorations. The stem should be trimmed and look fresh, not dry and cracked. Store red cabbage in the refrigerator in a perforated plastic bag. It will remain fresh for up to 14 days. If the cabbage has been cut, wrap in plastic wrap or keep in plastic bags or containers with lids. Keep in mind, that once cabbage is cut, it begins to lose its vitamin C content, even if it is well wrapped. Use cut cabbage within a few days.